Please Click the products links above to select the type of signs to review. 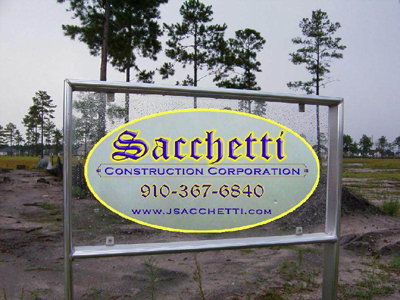 Feel Free to browse our Sign samples. 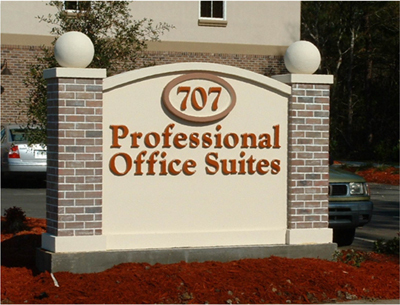 We are one of only two local factory authorized distributors and installers of Gemini Letters. 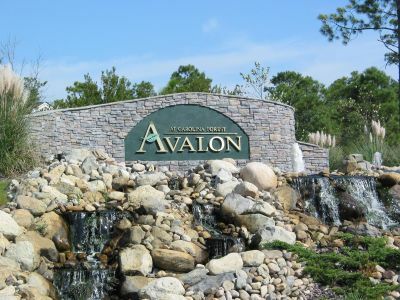 Gemini is the top manufacturer of architectural lettering, providing attractive and durable sign letters that come with a Lifetime Guarantee. They are available in a wide range of colors and text styles. 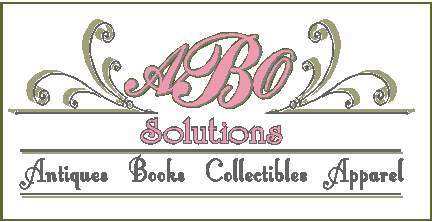 Come by and browse through our complete catalog of colors, finishes, and text styles. Monument sign with Gemini lettering. Building also has identical lettering in various places. This sign has been designed to meet all current hurricane required specifications. We use only the highest quality banner material (14oz.) for our banners. Depending on weather conditions, they can be used up to 2 years or more. Banners are great for promoting special events, festivals, grand openings, sale events and birthdays or to use as temporary signage for your business until you can get a more permanent sign. We can provide most any color in just about any size to accommodate your needs and can be fitted with grommets, hems, corner tabs or wind slots if required. 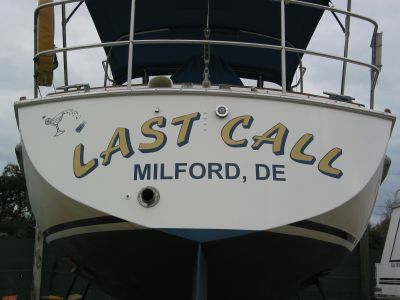 Southern Signs & Banners can provide onsite consultation regarding your ideas for lettering your boat. We will come to your slip or boatyard to get measurements, discuss text styles, special effects and overall design of any graphics you wish to add. After your approval of the overall design, we can also provide onsite installation or you can bring your boat by the store and we'll take care of the installation in house. 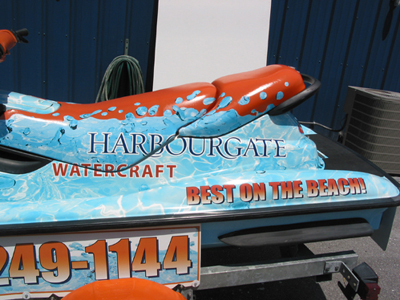 Personalize you personal watercraft. Great for advertizing. Need to promote an upcoming event for your business? Let us create an eyecatching promotional poster or show card for you with your logo and full color graphics and digital prints. Placing a show card or poster at the entrance of your business is an excellent way to promote upcoming dates for entertainment (dances, bands, benefits, etc.). 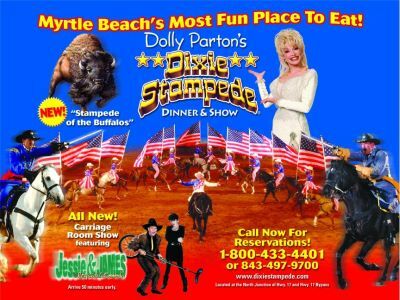 This is a digital print on vinyl adhered to corrugated plastic to promote the shows at the Dixie Stampede. This sign can be put in a heavy duty frame to be placed where it will be seen by tourists in the area to get their attention and interest. 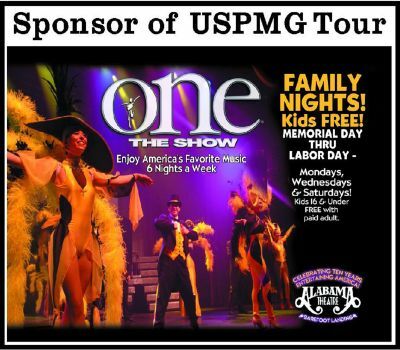 This is a promotional sign for the Alabama Theatre. This sign was used at Hawaiin Rumble Mini Golf as a sponsor for a tournament. It's easy to see what this establishment does! Window and Building signs for a unique Identity image. 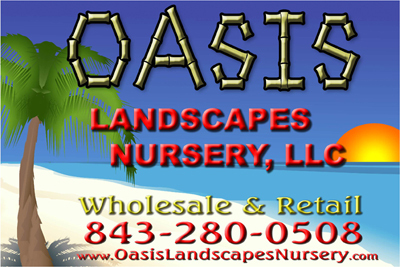 A corporate image was created using graphics on road signage, trucks, business cards and all company related items. A complete Corporate image package. 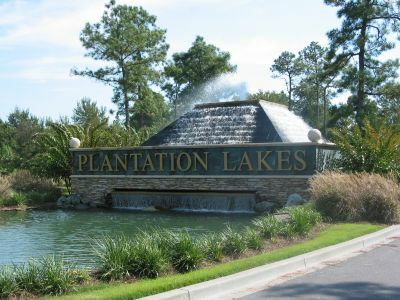 We work closely with many local builders to provide construction site signs, safety signs, directional signs, architectural renderings and aerial photography prints of new land and housing developments. 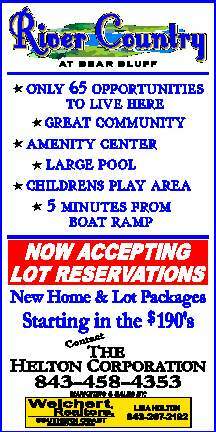 Call or stop by and let our signs work for you on your next project. 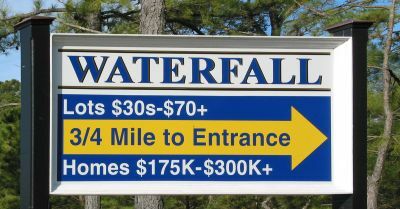 Directional and informational sign for Waterfall housing community located off Highway 90. For a unique look sign was produced on a clear substrate. 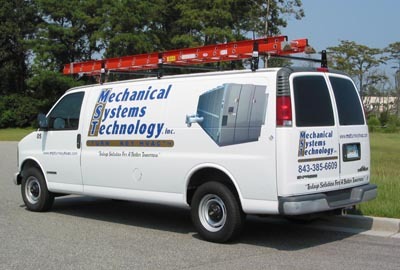 Vehicle signage is a cost 24/7 effective way to promote your company name and corporate branding, which is critical for success in today's business world. We apply the vinyl and graphics direct to the vehicle, so this is a more permanent solution than magnetics, but can be easily removed when it comes time to upgrade your vehicle. 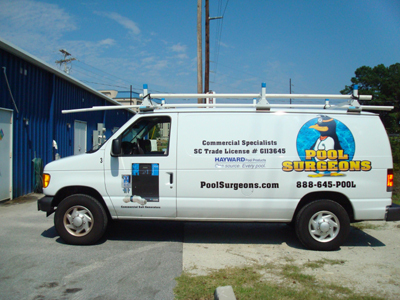 We can take care of all your needs with vinyl lettering and striping, standard vinyl or reflective, logos and graphics from a one dimensional outline or full color digital print. If you're just getting established and have one vehicle or are well on your way with a fleet, this is a great way to make everyone know who you are! Vinyl lettering & Digital Print graphics add a lot of character. 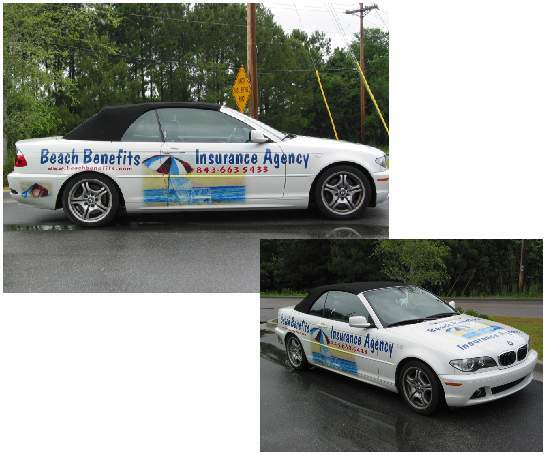 A great example of showcasing your product and service with a digital print graphic. 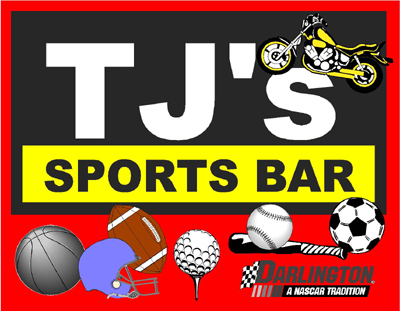 Great for 24/7 advertising and for special temporary signage. 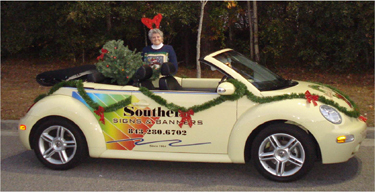 The Christmas Wreath on the hood is removable and gets replaced with different graphics for other special occasions. For full color, high resolution graphics, digital prints make a powerful impression. Our Mimaki JV3 uses UV solvent ink to print your graphics and lettering on our stock of different types of media (banner material, vinyl, canvas, etc.) up to 58" wide, which can then be adhered to any substrate. Output from this machine has an outdoor life of up to five years. With digital photography we can take a picture of you and/or your product and have it reproduced on your sign. This is an excellent medium for architectural renderings of new construction. Stop by our store for a demonstration, you will be AMAZED at the quality of this state of the art machine. 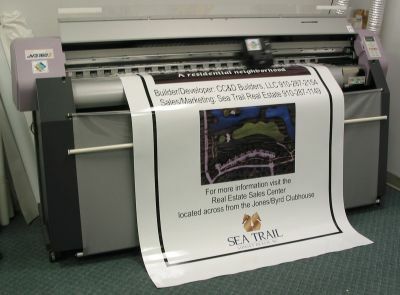 This is a 4'x 8' Digital Print of the architectural drawings for The Villas at Osprey Ridge. The graphics were brought in by the customer, we arranged the layout, printed the layout direct to vinyl and adhered it to Aluma-Clad. The buyer now has a visual concept of the property as it is to be constructed.